Artist. Born: November 14, 1897, Dunavant, Kansas. Died: August 29, 1946, Madison, Wisconsin. John Steuart Curry was born November 14, 1897, on a farm near Dunavant, Kansas, to Smith and Margaret (Steuart) Curry. Curry’s parents were well educated and helped him gain an appreciation for art. The oldest of five children, Curry also enjoyed participating in athletics. He attended the Kansas City Art Institute, Art Institute of Chicago, and Geneva College in Beaver Falls, Pennsylvania. Following graduation Curry worked as an illustrator for Boys Life, St. Nicholas, County Gentleman, and The Saturday Evening Post. In 1926 Curry went to Paris to study the works of realist Jean Désiré Gustave Courbet, Honoré Daumier, Titian, and Peter Paul Rubens. After returning to the U.S. Curry married Clara Derrick on January 23, 1923. She died in 1932. Curry traveled with Ringling Brothers Circus and featured the acts in some of his work. He married Kathleen Gould in 1934. In June 1937 a group of newspaper editors began a movement to commission Curry to paint murals in the Kansas State Capitol. While the public watched Curry work, a controversy arose over his choice of subject matter and the way it was portrayed. Amidst the conflicts and criticism, Curry ceased work on the murals in summer 1942. His request to remove some Italian marble from the rotunda was refused. Curry decided to quit in protest and never signed the murals. Among those murals, Tragic Prelude, with the image of John Brown, is among the best known public art works in the world. Curry returned to Wisconsin to continue his teaching. Curry died August 29, 1946, in Madison, Wisconsin. He is buried in Winchester, Kansas. 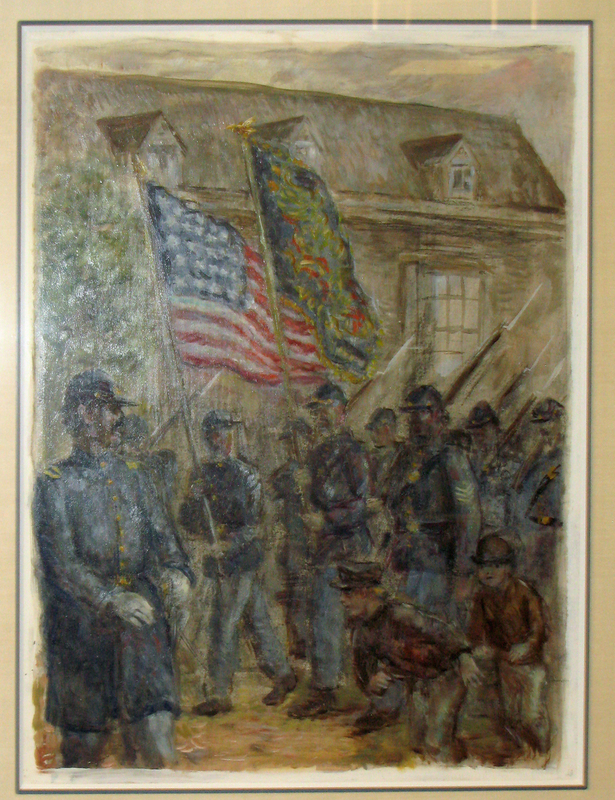 Curry, John Steuart , “Federal Soldiers Returning from Duty,” Westport Public Schools Digital Collections, accessed April 24, 2019, https://collections.westportps.org/items/show/1556.